Sitech WA are pleased to announce they are now your authorised Lincoln Industrial agent. Lincoln builds precision lubrication equipment & components for hydraulic, pneumatic and electric auto lubrication systems. State of the art electronic controls for all forms of mobile and static equipment in the civil, mining, quarrying, forestry and agricultural sectors. As your new supplier, Sitech WA now offers the full range of Lincoln Industrial fully automatic lubrication systems as well as installation and servincing. 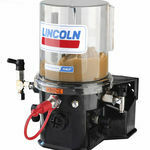 The Lincoln line includes Centro-Matic® single line injector systems, Quicklub® progressive systems and Duo-Matic® pressurized two-line systems. All of these centralized lubrication systems direct precise amounts of grease to bearings or other lubrication points and all equipment is designed to meet the strict quality standards demanded by our customers. Lincoln CentroMatic® systems and components are made to match your application. Systems can service one machine, different zones on one machine or even several separate machines. Regardless of the application, the principle of centralized lubrication remains the same: a central pump station automatically delivers lubricant through a single supply line to the injectors. Each injector serves only one lubrication point and may be accurately adjusted to deliver the precise amount of grease or oil required. With this new line of products added to our toolbox we believe we can continue to serve civil and mining contractors throughout Western Australia and offer advice on the right technology for the job, customized training, data services, installation, service and technical support and become a one stop shop for all your site technology requirements. The Lincoln Quicklub system is designed to provide a relatively simple and inexpensive method of centralizing or automating the lubrication process. 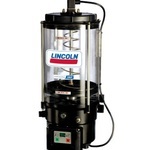 In a Lincoln Quicklub system, lubricant can be supplied either manually, with a grease gun, or through a fully automated system using electric or pneumatic pumps and progressive metering valves. The Quicklub Electrical pumps are vibration-resistant and shock-resistant for use on mobile equipment. Quicklub pumps cater to all industry applications involving small and mid-size machinery and systems with up to 250 lubrication points. 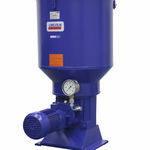 The Lincoln Dual Line System is ideal for long pumping distances and extreme temperatures. It is easy to adjust to meet specific bearing requirements. It provides high pressure, up to 5000 psi, and is designed to work with many lubrication points over a wide area and easily handle very viscous (heavy) greases.